After a month break I'm back again with another fellow blogger to feature in this space. 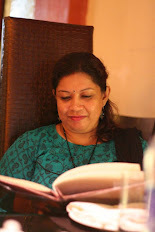 As many of you know that this is an event started by my group, "Kolkata Food Bloggers", where we feature one of our fellow blogger on every member's page and we all cook something from her blog. This week, I introduce you to Manjari of For the Love Of Food. She is blogging for little more than a year now, but her blog is a treasure trove of all classic recipes from allover the World. The speciality of her cooking is that she never uses any short-cut method, instead she cooks all of them from scratch and explains the method in a very simple way to be understood by novices too with her in-depth knowledge on them off course. You'll get to know all sorts of recipes from all kinds of cuisines, International and Indian regional cuisines if you visit her blog. So, do not waste time and visit her blog now. I've eyed on one of her post "Napolitain Biscuits" when she posted it last month. She tried out that recipe from a book of collected recipes of Larousse Gastronomique. My kids are fond of cookies and I prefer to make them at home. These crispy buttery biscuits are delights for kids. I followed her recipe and made the cookies. From my research on web, I found out that there are a pastry from Mauritus available where they make cookies with almost similar ingredients and then sandwich two cookies with strawberry jam and then they dip them in pink sugar glaze. I was intrigued with the looks of the pastry and wanted to try that out. 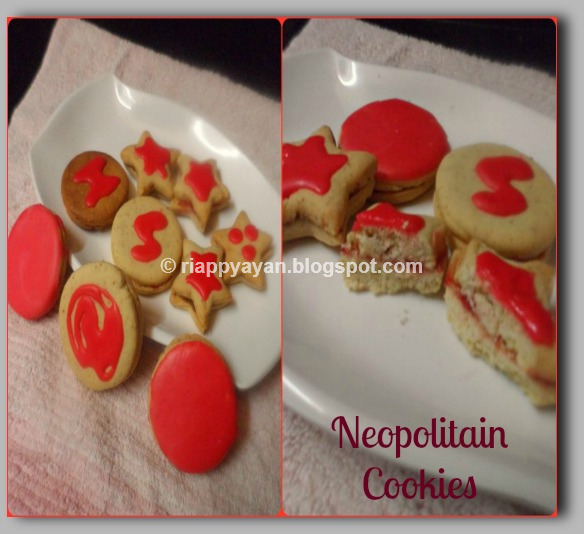 So I followed Manjari's cookie recipe and followed the looks of Mauritian Napolitain cookies. 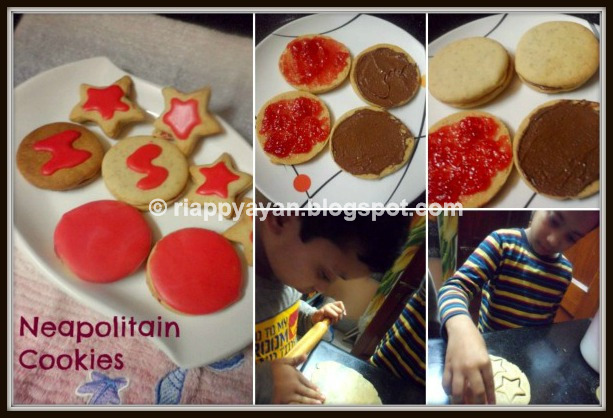 I sandwiched some cookies with strawberry jam and some with Nutella in kid's demand. I used very less sugar glaze on cookies as I want my kids to consume as much less sugar they can. I just decorated a little with the sugar glaze. You can also totally skip the sugar glaze part. My kids helped me a lot doing these cookies and they loved it. Here is the original recipe from Manjari's blog. Mix the flour with baking powder and Keep aside. In a bowl, take butter and mix with the flour using your hand till you get a breadcrumb like consistency. Then add in sugar, almond flour and finally beaten egg yolk. Mix in everything and form a smooth dough. If needed you can add little more flour but do not add even a drop of water in the dough. When dough is done, wrap in a cling wrap and refrigerate for at least 30-45 minutes. Take out and divide the dough in two equal portions. Sprinkle little flour on your kitchen counter and roll out the dough using a rolling pin in about 1 cm. thick circle. Cut in round shape with a round glass or in any shape with a cookie cutter. Similarly, cut out cookies using the other half of the cookie dough. Grease a baking tray and arrange the cookies on the tray and bake in middle rack of your oven in 180 degree C for 12-15 minutes. The cookies should not turn brown. Cool on wire rack when you bake the next batches of cookies. To make sugar glaze, take powdered sugar in a bowl, add few drops of milk in there and mix with a spoon. The sugar glaze should be very thick. Add few drops of red food coloring and mix. The glaze is ready. Apply a little strawberry jam/chocolate spread on the down side of a cookie and apply down side of another cookie on top of the jam used. This way make sandwich cookies. lastly, dip in sugar glaze or drop little glaze on top of the cookies. You can also decorate with sugar glaze as you wish. I didn't want to dip the whole cookies (just did two to show you the original Neapolitain cookies), as it'll be too much sweet for kids, instead I just decorated the cookies with few drops of glaze. I wrote the initials of my kid's names I, T and S and some little decorations. 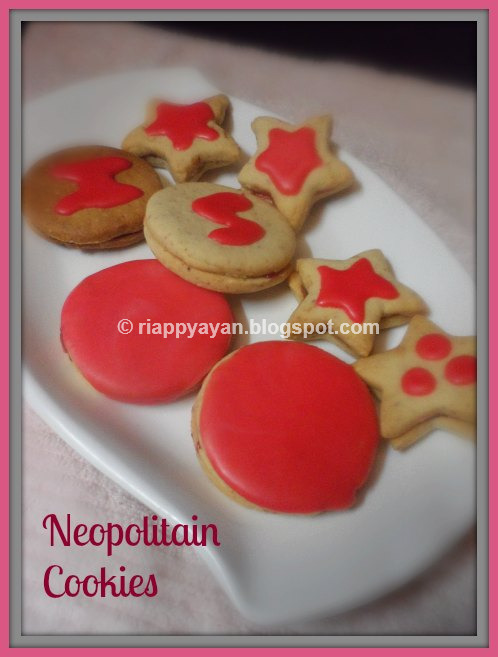 Try these simple yet healthy cookies at home for your precious ones and see them enjoying these crispy delights. You can totally skip the sugar glaze too. It takes hardly an hour to bring joys to your loved ones. 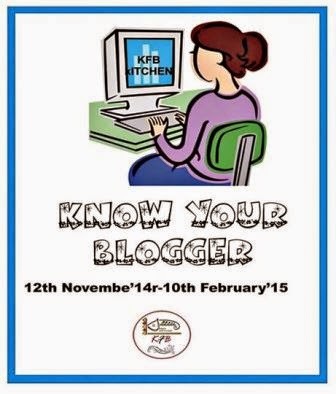 I'm sending this to KFB's ongoing event, "Know Your Blogger-2" .